I have used Delphi for PHP for the last year. I have tried to install the PHP TChart Trial version on my local machine Windws machine but have had no luck. I have read and followed the instructions at http://www.nusphere.com/kb/phpexpressmanual/part1.htm? still I had no luck. I think a lot of us are giving up because of this learning curve or battle. Is there nothing you could do to make this transition easier. Of course, we thought that following the steps described at the install.txt file should be enough. Did you follow these steps ? ( the ones under the "Installation under Delphi for PHP IDE"). ; (extension=phpexpress-php-5.2.so depending on the server). Then close and open again the Delphi for PHP and all should work fine. We're also doing some tests here with the Delphi for PHP and TeeChart for PHP obfuscated version. 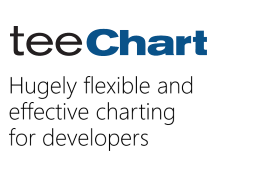 Yes, at this moment the Chart can be placed into the form as a component (from the component palette), but we plan to add a designtime editor as in the other TeeChart versions. I've updated the install.txt file here (adding some comments about the phpexpress installation) for the next maintenance release. Please , do not hesitate to contact us is you still having problems or you want to comment us something (as in this post) to improve it.